and yes that’s supposed to say -1(negative 1). cuz tomorrow would be day 0 (zero). meg and clay and gayla and justin and allison left for europe after lunch. i’m pretty jealous too. today i headed to port A early to get set up and whatnot for the wk. what’s goin on here is a lady in riding shorts, sitting on a roles royce in front of the department of health and welfare. 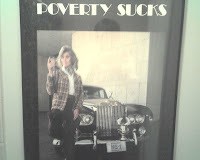 i thought it was ironic cuz it was in our condo’s bathroom.